A while back, I went on a few dates with a guy who was really cool. He wore leather jackets and combat boots without looking like he was trying too hard. His hair was a perfectly-sculpted work of rockabilly art. When you really pressured him, he’d reluctantly tell you vague details about his band, which won a national television contest, toured with some major stars, and has its own Vevo channel. He didn’t like to talk about it because it was, like, not even a big deal or whatever. What I’m trying to say is, he was very, very cool. He was so cool that I couldn’t function around him. When we’d go out to eat, I was elated that this obviously cool person was going on a date with little ole me, but as soon as anyone looked at us, I’d imagine what they were thinking and I’d mentally apologize. “I know! I know!”, I’d think. “He’s extremely cool and I just made a pterodactyl joke and choked on my own spit. IT DOESN’T MAKE SENSE TO ME, EITHER.” It was an exhausting self-esteem roller coaster with way too many bad dinosaur jokes, so we soon went our separate ways. He’s working on another album in Nashville. I’m knitting a misshapen hat. We’re both happier now. I like my men like I like my pterodactyls: bony and unable to play country music with their weird claws. Clearly I don’t have the best grasp on what’s cool. If I did, I would have been a lot less stressed out between the ages of 11 and 18. I’m better at identifying what isn’t cool. I spent middle school and high school trying way too hard to be cool. Between 11 and 14, I wore more glitter than Ke$ha. I wanted skater shoes, but the closest thing I had was a pair of hiking boots, so I wore them every day. I have a picture of myself wearing those boots, a denim mini skirt, blue eyeshadow, and bright, dyed feathers in my hair, like a side-effect of puberty was sprouting yellow and blue feathers from my head. I tried just as hard in high school, but my revised plan hinged on the idea that being cool is about more about your attitude. I was going to be so uncool I’d come out the other side cooler than everyone else. I wore my dad’s old sweaters and had earnest conversations with my friends about challenging beauty standards. I drove a 1988 pickup truck with wooden slats that looked like a piece of tin foil someone had crumpled up and then smoothed out again. I stayed home from prom to squish cupcakes with my bare feet, and yet somehow I still wasn’t cool. It turns out trying to be cool is like trying to escape quicksand– the more you struggle, the faster you sink. Eventually you’re forced to surrender to a nerdy, sandy doom that everyone will tease you about. By the middle of college, I’d accepted the fact that with 20 solid years of awkward clothing and conversation behind me, I was never going to be cool. Then something weird happened. Suddenly, things that were not cool when I was doing them as a teenager became very hot. – Glasses are in! People with good vision pop the lenses out of reading glasses just to fit in. – Deathly pallor is in! This is great news for vampires and the melanin-impaired. – Geek culture is in! When I tell people how awesome my Darth Vader Voice Changing Mask is, they have to nod in agreement or risk social alienation. I also no longer have to pretend to have any athletic ability! You WISH you were a noodle-armed nerd! – Skinny dudes with weird facial hair are in! This justifies almost every crush I’ve ever had. Thanks, hipsters! – Ugly sweatshirts are in! In many cases, they are meant to be ironic. 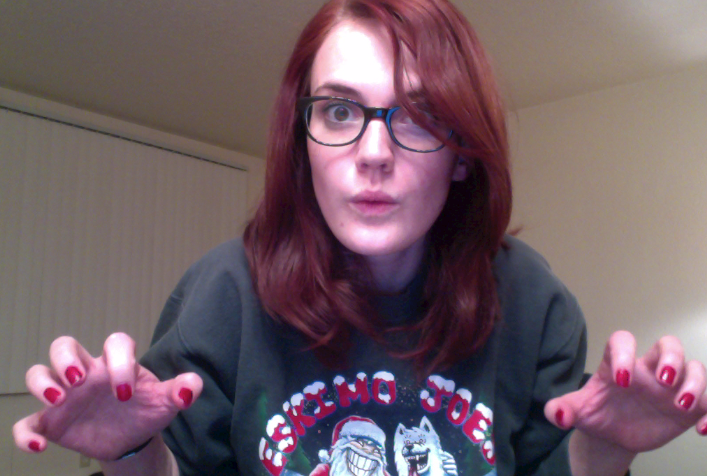 In my case, my grandma bought me several comfortable, terrifying Christmas sweaters that are great for freaking people out, so of course I wear them. I wear it year-round because every day should be the nightmare before Christmas. I have a leather jacket now (Fine. It’s pleather. ), and more friendship bracelets than I can count, but I guess I didn’t need them. I was born incredibly uncool, and through some bizarre twist of faddish fate, I became… well, I won’t say I’m cool, but I will say I’m not not cool. I’m accidentally all the rage. I know the pendulum will swing the other way soon, and I’ll recede back into nerdiness. They say you stop caring about what other people think of you as you age, so I’m counting on apathy to get me through my transition back into a fashion pariah. On the other hand, my inability to adapt to the next fad may actually be even more embarrassing– I’ll be like a mom who can’t let go of her ’90s haircut. I’ve heard it takes the middle of the country about six years to catch on to trends from either coast, so I could always try to outrun my imminent depreciation by moving deeper and deeper into America’s heartland. Someday I’ll be living in a cave in the middle of Kansas. I will be the coolest one there. P.S., This is my favorite pterodactyl joke of all time. I’ve got news for you, Steph … not trying to be cool is über cool. If you have to try … forget it. And FYI … everybody but everybody knocks mom (& dad) jeans … that’s so not cool, that’s just herd. 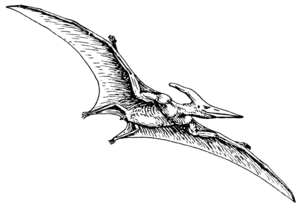 My favorite pterodactyl joke: Why can’t you hear a pterodactyl go to the bathroom? **** Because the P is silent. Is NOT having a Facebook page because there’s more to life as cool as having a Facebook page, but never using it because there’s more to life? Please say yes, because I don’t have an account on any of the social networking site. (I don’t like them). As a guy who has celebrated geek pride since 1999 I have to say that it is nice being cool for who we are. I do admit that before that I was pretending to be a “cool” kid before I hit high school, I even pulled it off. Even then I was still a geek, I did not tell my friends that I though math and science was fun, I especially did not tell them that I had a mad crazy love crush on the quite weird geek girl everyone made fun of. They did give me some grief because i was always nice to her. Eventually I married another geek, not that one girl, although I think about here from time to time and hope she found her punk rock skater scientist. Even if the geek thing falls out and we become uncool again I would consider you and all other geeks cool because were are cut from the same cloth and I am not going back “fitting in” because that lame and I am way too old to care. Dinosaur jokes ARE cool btw. Oh, and here in Aus there are groups of places and people who still rock the mullet. IT is more frightening than you can comprehend. I’m using that pterodactyl at the next possibly opportunity, which is probably the grocery store. I’m to tired to be cool. Bring on the mom jeans. I’m sorry to be the bearer of bad news, but actual nerds are still not cool… ‘nerd-chic’ and the like is only cool when people who are already cool appropriate the trappings of the uncool. It’s their inherant coolness that makes the difference. We will never be like them. Just to be a complete bore here, I’ll point out that “cool” is one of the most overused, and therefore meaningless, words in the language. It’s really best not to think about “cool” at all. Excellent read, I also fall for the having a Facebook but never using it. I admire the will power it takes, or doesn’t take? I don’t know, I’m not that cool .